Every now and then, it can become a pain when you're having to deal with unwanted Windows components which are usually impossible or very difficult to remove. In many cases, some of the applications that Windows comes with are completely useless to the primary user of the operation system and in others, they can slow down the system and take up valuable disk space. The worst part about these unwanted applications is that even if they are removable somehow, it usually isn't possible to do that with Windows Add/Remove programs from the Control Panel or third-party uninstallation applications. This is when nLite comes in handy. Version 1.4.9.3 is a freeware program which does not have restrictions and it's free so it doesn't cost anything. 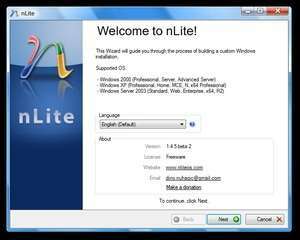 For security reasons, you should also check out the nLite download at LO4D.com which includes virus and malware tests. Additional screenshots of this application download may be available, too.